The next Nec event is the one above, another chance we hope to present our club and cars to thousands of visitors to these massive events, and raise the profile of both. Subject to being given stand space and l repeat subject to, we really want to ramp up our presentation as we will be in the 30th year since the start of Gto/3000gt/Stealth production and we hope we can get to an anniversary event in 2020. But with the Nec shows we can celebrate this as well and the organisers like circumstances like this very much. So we want to put on a bigger show if given the space and have asked for an area to display 6 cars, show the production history mk1 to mk4 etc and maybe restoration aspects of our cars or other stuff as well. We want to know who in the club would like to show their cars and will be prepared to commit to bringing the car to the Nec on the Thursday (or maybe on the Wednesday if poss and you want to) before the show and it will be there until the show closes on the Sunday at 5.00pm, prior to the breakdown. You need to realise the travel and accomodation costs associated with showing your car, depending on where you are travelling from and allow for any spend, food etc, during the event. It is a bit to spend unless you live close to the Nec but a fantastic event at which to show your car to so many visitors. We also would like to know who would like to be at the show with GTOUK and enjoy the rest of the show as well, of course and entry to the event will be free by wristband each day subject to a maximum number depending on number of cars displayed. Any further general interest is appreciated. As it stands we have pitched for up to 6 cars and it would be good to know from within the club we can meet that, who knows maybe we will have to pitch for more!! So please show your interest from now and the club will know what it needs in respect of display cars and members attendance. Thanks for your attention everybody, looking forward to March. I will happily show mine off, I will just have to confirm closer to the time when work has a better planning. Sorry to be a pain, just registering my attention. I should know better by end of January. Pearl will definitely be polished by then. Booked time off with work. So happy to show “Pearl” off to the world (well NEC). Nice to meet you at the Nec and now we will start putting together plans for next March and you are on the list and waiting to see how many others will put themselves forward. We will see how many wish to show their car and who wants to be at the show with the club, then it can decide how to present. Thank you very much for flagging up you wish to be there. 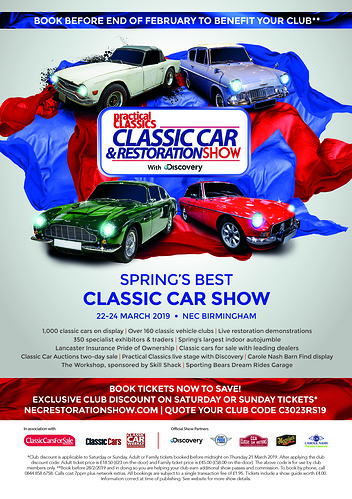 Due to the NEC classic shows being limited car number stands, and to make sure all full members get the chance to take part we will have 2 lists. List 1 will be for members interested in attending that have not been before. List 2 (reserve list) is for members who have already attended but would like to show again. At the moment we have not been allocated a stand so are still unsure of how many spaces will be available. These are great shows to be part of with or without your car on show. The club has to give write ups on the cars attending and meet other criteria from the organisers. Because of this we will need to set a deadline date of FEBUARY 1ST 2019. After that we can work with the lists we have and the spaces available. We are Happy to announce we have had the GTOUK club stand confirmation for the event. We have been offered a 9.5m x 12m space. Any members interested please add your name to the lists. Anyone else would like to be on the stand at the NEC or thinks they may be interested, even if you can’t commit just yet, post up here. Ideally it would be great for the Club to get some different examples this time. If anyone is interested in attending please add your names to the list. Its a great event, and it would be great to see some different club members/cars there. Somewhere you would be proud to have your car on the stand. Would anyone else like to display their car on the club stand in March? Am willing to make the journey from Aberdeen in the non turbo if you feel it’s worthy ? Never been and a brand new got owner so would be good to meet some if you guys? Never been, You got me thinking now but yes it’s very good show and our cars worth seeing ! Confirmed cars for the Show are. We still have places available so any members wishing to attend with their car please let us know. As I am still willing to show Pearl.